I was in Mansfield for business visiting Phoenix Brewing Company. I visited a brewery for work. Yes, that is pretty cool. I had only passed through Mansfield very briefly before. My inner nature is to explore any new place so I blocked out a little time to drive around downtown and get a feel for the place. About one minute into the journey I spied a sign for Famous Coney Island. Regular readers know that by the Code of Gourmand, I was obligated to stop – hungry or not. I did. I walked in 6 minutes before closing time (7 pm) to look around. The waitress (that would be the proper term here) asked me if I wanted to order. I said that I didn’t want to be a pain, so I would just look around. She said “sweety, go ahead and order it’s not problem at all.” There are not many places that would gladly welcome a customer that close to closing time. I also found out that the sign outside is somewhat new, the original sign was inside over the counter (from 1936) when coneys were 5 cents each (that is part of the reason they took the sign down). Of course I ordered a coney. The coney dog is an institution in many towns, especially smaller towns and I always visit one when I can. 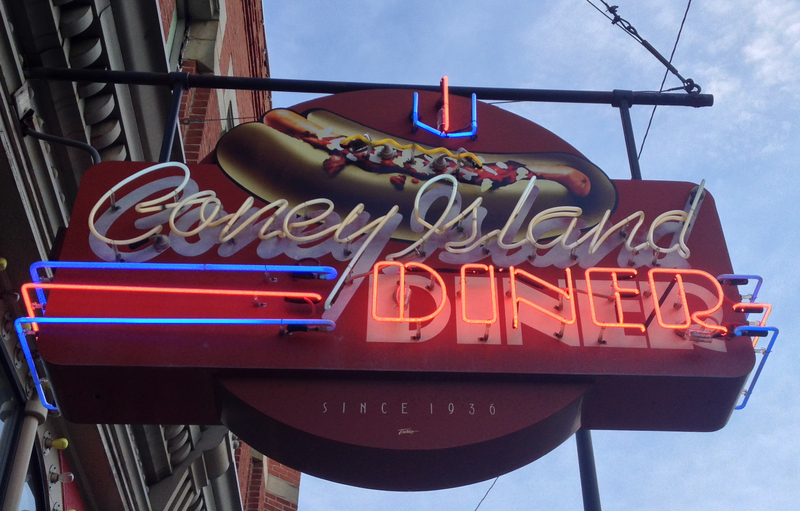 There is culture to a Coney Island joint, the same as a diner. There are stools at a counter and a few booths. A simple menu and the banter of regulars served with the insights of the folks behind the counter that have been gained from decades slinging hot dogs or one liners at the same place. You can’t find that at many dining establishments. And those few places are disappearing every day. The other thing I did was survey the menu for “the thing“. Just about every diner or Coney Island has an off beat dish that is unique to the place or a carry over from another time. A signature or iconic item that sets this place apart from any other place like it (and often there are a lot of place like it). Here the thing was pea salad. There was no description of what it was but I knew I was going to get it and probably enjoy it. 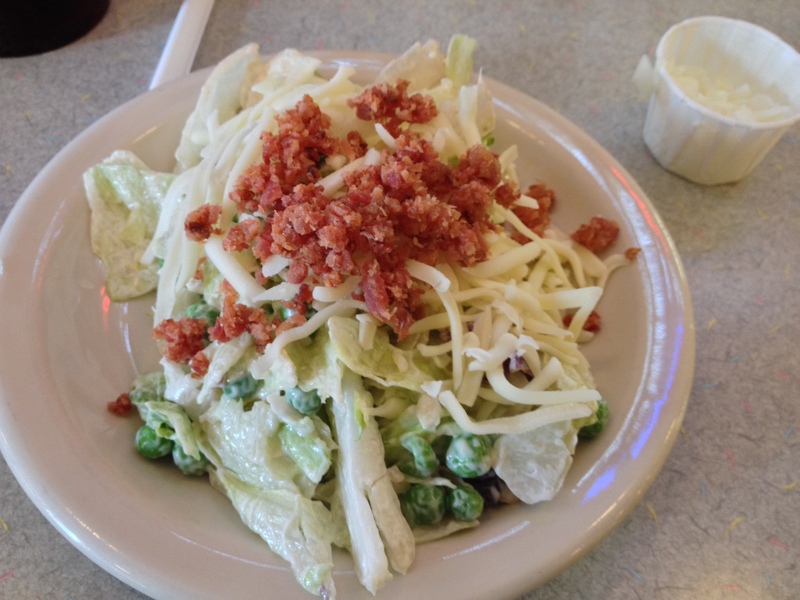 The base of the salad was ice berg lettuce with a mayo based dressing, peas, shredded carrots, cheese, shredded cabbage and bacon bits. It tasted a bit like a seven layer salad. It was simple and it hit the spot. A comfort food classic. The place itself could have come from a Norman Rockwell painting. There was a small ice cream stall at the end. 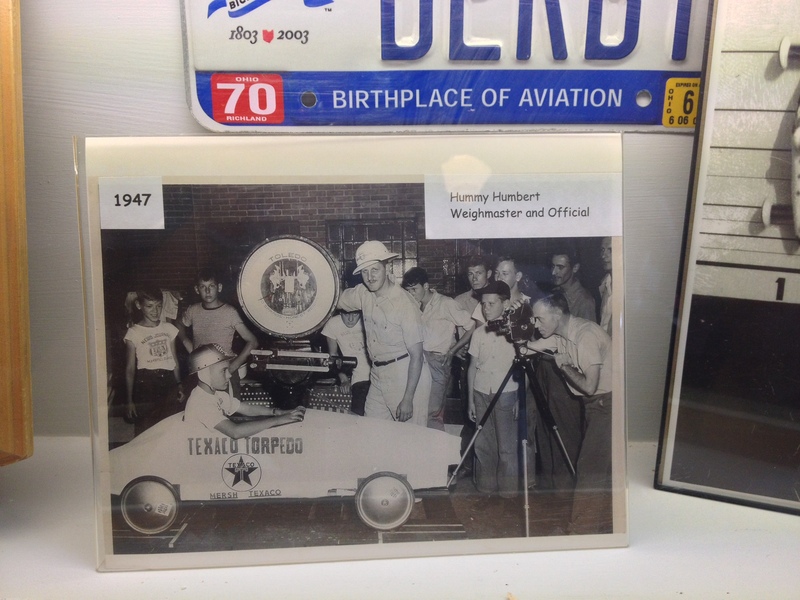 The walls were decorated with year books from the local high school, photographs from the old days, a soap box derby car, and the like. It was a decent meal. A respectable coney (no Oh Betty’s but what is) and a great pea salad. There are all types of culinary tourism. This type is where the food, while good, is secondary to the stories and the traditions. That is OK. I got back in my car, drove by a bakery that looked interesting, a place called the Squirrel Den (that sells candy and cards), an old school newspaper stand and a pizza place (Two Cousins) that claims to be the best in the world. All were closed. I would have liked to drop in to each. It took a minute to drive by those spots and that is when I saw something else on the other end of the square – Coney Island Inn. And oddly (it was after 7 pm) it was still open – until 8 pm, which in this case made it the Late Night Slice of Mansfield. I decided I needed another coney so I would know which was best. 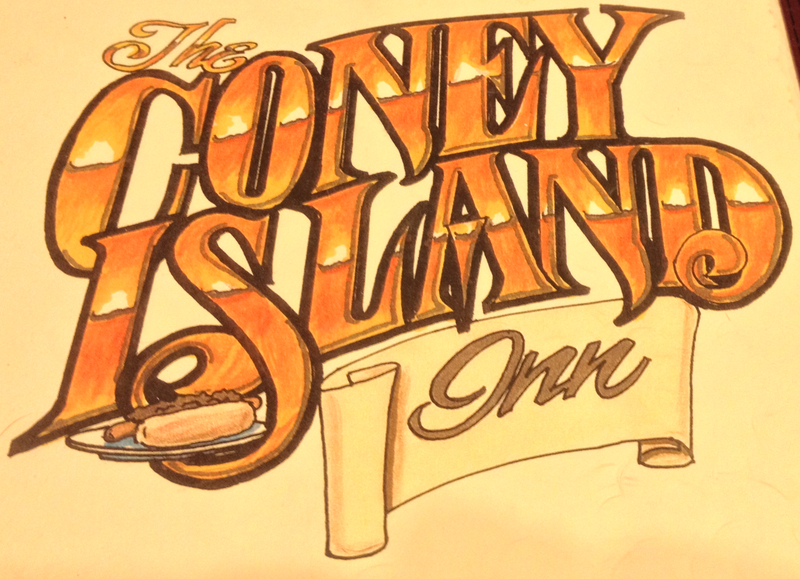 Coney Island Inn is a bit bigger, a lot less brighter and it has an in house Ohio Lottery sales counter. I grabbed a stool to survey the extensive menu – which may very well include every comfort food classic of the Midwest but I knew that I would only be having coney. I have standards, this was my second meal in 20 minutes. The dilemma I encountered was that they offer a regular coney and a King Coney (and foot long versions of each). It turns out the King Coney was a bigger, all beef hot dog and the coney was smaller and not all beef. I had to order both which I did with slaw and coney sauce. 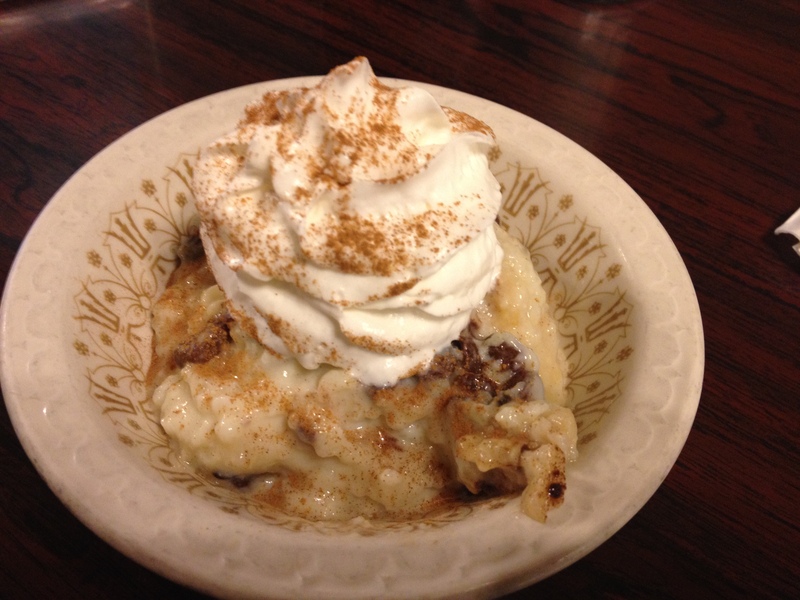 Then I asked the waitress if there was anything else I had to get and she suggested the rice pudding (with or without raisins and with or without whipped cream). The coneys were good (not Oh Betty’s good) and I would say better than what I had at Famous Coney Island (and less expensive). The rice pudding on the other hand was exceptional. I had good conversation with the other staff and the one other customer in the place (she sized me up pretty quick – “you’re not from around here are you, or you would know what to order”). I was glad I took a detour, I usually am. So now for a short dialogue about small town Ohio. The impromptu adventure I had is something many people would avoid. Others would just write off these places or the places I could not get into as not worth their time because they figure the food is not up to their standard or because it is middle west bland. Sometimes the food might not be worth it, but again, each place has “the thing” and all have a good story or two that will connect you with the place. Both Coney Islands I visited have long histories in Mansfield and longer traditions. 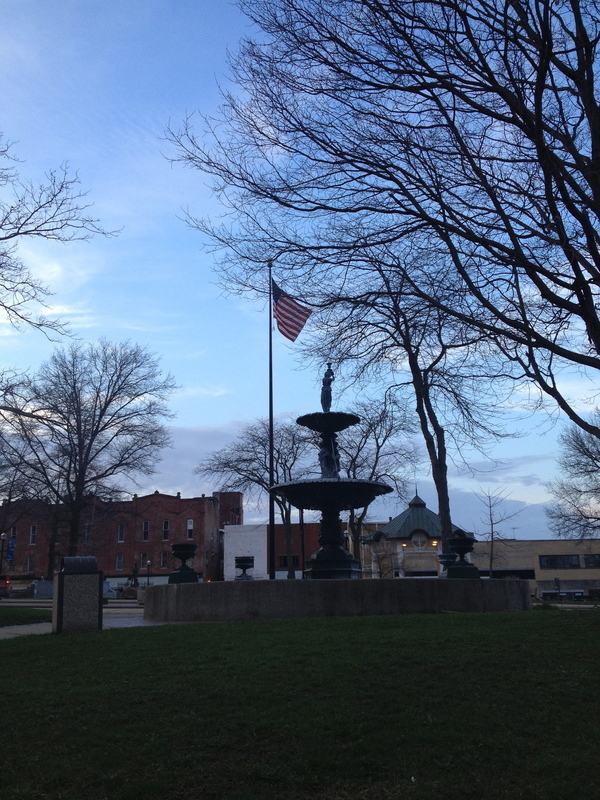 Actually Mansfield is not technically small town Ohio, but the town square sure feels like it so I’ll just use that as an excuse for my commentary.